Every time we roll the Locost out into the driveway (yay!) we have to chock the wheels, or at least one of them, because the driveway is slightly uphill. So it seemed reasonable that our first task in getting the car running would be to install the handbrake. This will have the added benefit of providing a way to stop the car should we somehow fail to resist the temptation to roll the car out into the street. 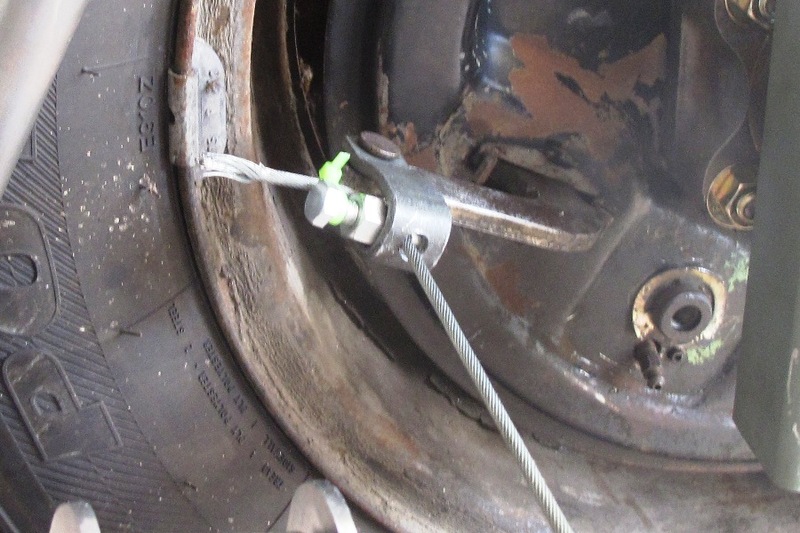 We planned from the start to use the stock MGB handbrake, and so that's what we did, although it turned out to be a little more than a bolt-in job. We knew we'd have to shorten the brake cable. The handbrake in the Locost is three feet closer to the rear axle than it was in the M.G. donor. We weren't exactly sure how we were going to do that, since all the cable ends are permanently swaged, but we found some cable clamps online that look like they were made for an M.G. handbrake, so we bought a dozen, not knowing exactly how many cables we'd have to shorten. It turns out we only had to cut off one of the swaged ends, so if anyone out there needs a bunch of 1/8" cable clamps, let me know. 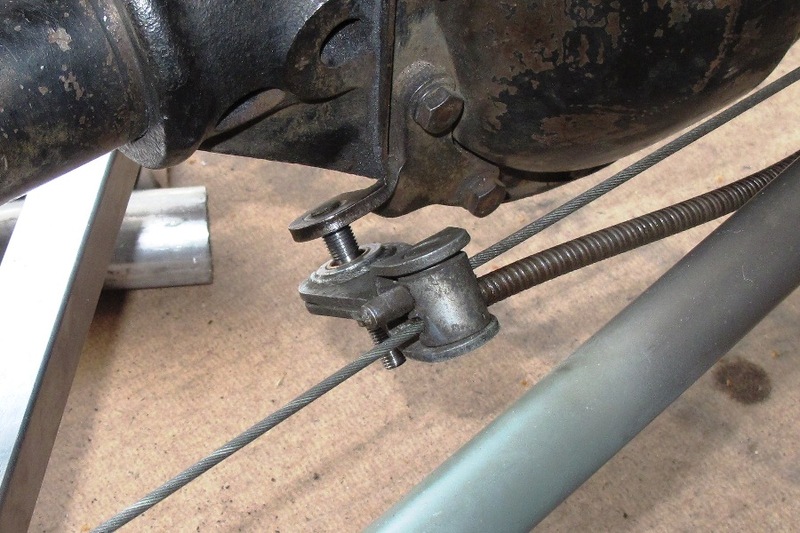 The forward cable stop for the handbrake is a big block of metal that bolts to a bracket in the MGB transmission tunnel. We don't have a bracket like that, so we had to make one. Luckily we happened to have several spare brackets lying around, actually former attachment tabs for the scuttle, that turned out to be exactly the right size, or close enough. 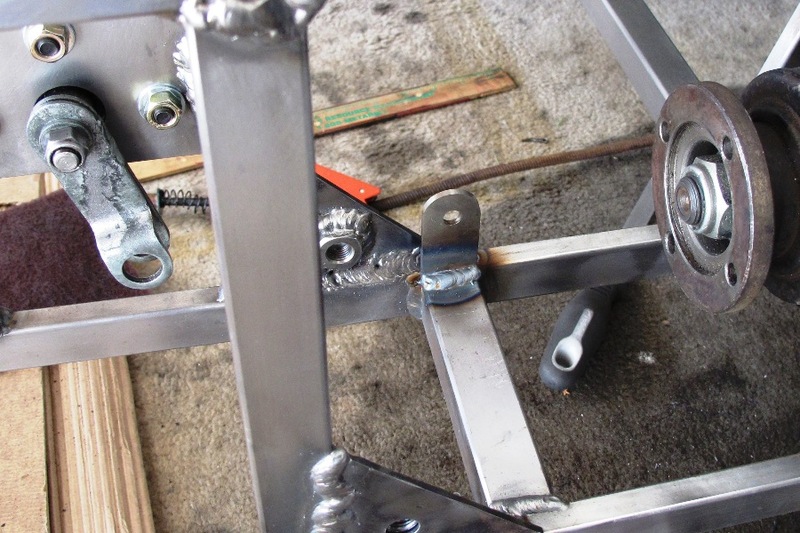 We welded the tab in place, all the while congratulating ourselves for having the foresight to install as many components in the car as we possibly can before stripping the chassis and painting it. 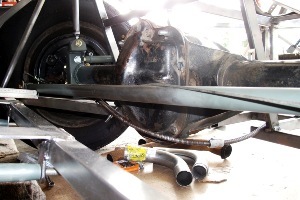 The next step was to route the shortened cable housing to a pivoting cable stop on the differential case. 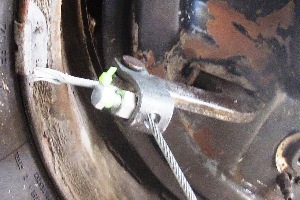 The cable continues on from there to the nearside brake, and a second cable takes off from the pivoting stop to the offside brake, an arrangement that provides equal tension to both rear brakes. It's actually pretty clever, at least for a British car, although it does have one drawback: The cables from the differential case to the brakes are under tension, and therefore need a straight shot to each rear brake, no matter how much the differential moves around. This arrangement works perfectly in an MGB, because that car doesn't have anything back there to get in the way. We, on the other hand, have a Panhard rod. And naturally the cable that runs from the pivot stop to the nearside brake wants to go right through the middle of it, because we haven't yet reached our quota of annoying clearance issues on this godforsaken build. Obviously we have to do something about it, at least if we want a handbrake, and I think we all do, so this is the part of the show where we discuss our options. Option one is to relocate the Panhard rod. Hopefully you're laughing at that one as hard as we are. Option two is to wrap the cable and/or Panhard rod in some kind of Teflon substance, or Teflon itself, so neither slowly abrades the other into oblivion as they run in contact with each other. That's a reasonable solution. For complete amateurs. Which of course we're not. We are incomplete amateurs, so we know better. We also know that in sharp turns the Panhard rod leaning on the cable could apply the brakes. Maybe not so hard that it sends us into a wild spin, but enough to affect performance. And brake life. Option three is a variation on option two, for those amateurs like us who have progressed beyond the complete stage. This option would implement some kind of block and tackle arrangement that would route the long cable safely around the Panhard rod. 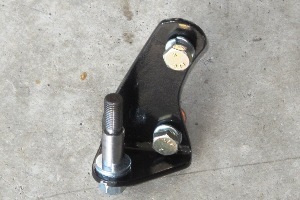 Although this would probably be a big hit with the Goldberg family, unfortunately there really isn't any place on the axle or differential case to attach either blocks or tackles, and so we had to quietly put this idea behind us and move on to the rare option four, which is to relocate the pivot stop. The pivot stop could actually go anywhere between the rear brakes. It could even float in space. In fact, it's floating in space right now and the handbrake works fine. The only reason the pivot stop is attached to the differential cover is so that it doesn't wander off and get tangled up in something important, like the fuel lines or the driveshaft. So I'm thinking we probably want to do the same thing. 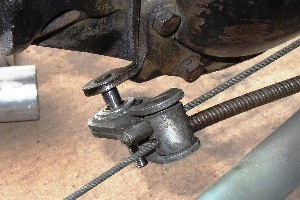 As luck would have it, the bracket for the pivot is not welded to the differential case, but only bolted on, using two of the eight bolts that secure the differential cover to the case. That looked like something we could do, so we made our own bracket, which will attach to two different bolts on the differential cover, and we'll cross our fingers that we can remove and replace these bolts without disturbing disturbing the gasket, thereby creating an Exxon Valdez-type incident in the middle of our garage. We made our cable stop bracket out of 1/8" wall square steel tubing. Big shocker there. 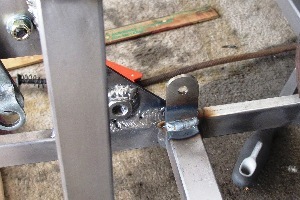 The original bracket was made from much stronger 3/16" steel, but two things: First of all, weight. You know how hard we work to keep the weight down on our Locost. Second, we don't have any 3/16" steel, at least not in tubular form. We do have some 3/16" wall angle iron, but we're not going to use any angle iron in our Locost because nothing says homebuilt and amateur quite like angle iron. Except maybe plumber's tape. So 1/8" wall tubing it is. The bracket looks plenty strong. Of course we have yet to attach the bracket to the differential case, because once again someone got it in their head that it would be a good idea to paint it first. But we're optimistic. Next time we roll the car out of the garage to work on it, we won't need wheel chocks. We'll use them, we're not stupid. But we won't need them.